Sometimes in life, some of us are born creative, some of us don't find our creative skills until we're older, and some of us don't find creative skills whatsoever - like me! However, when you become a parent, being creative is something you'll soon have to get use to doing! I'm not talking about being creative with what name to give your children, I'm talking about everything, like making a rocket out of a cardboard kitchen roll tube with only cotton wool to help you! Or making your childs lunch pirate themed, when you don't have any pirate shaped cutters in sight! Then there's turning a plain white t-shirt into a Pudsey t-shirt because you forgot it was dress up day at school! Or cutting, sowing and chopping at clothing items that aren't cheap to make a costume for a world celebrated event, and lets not forget being creative when it comes to stories when your child has given you five keywords to create a story with; a prince, banana bread, Batman, a bouncy castle and a dog! Over the years, my creativity has improved, but I must admit I take you the trusted internet to find a lot of ideas! 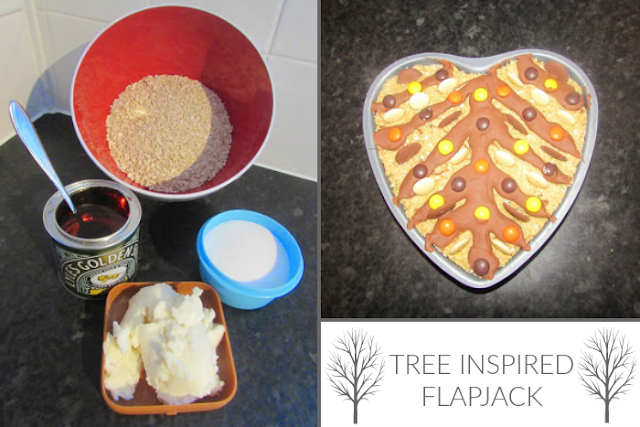 So can you imagine my surprise when my niece come round for a sleepover, and came up with a new idea not long ago to make a tree inspired food object, not just any food may I add, but flapjack! I didn't even know if I could make flapjack, let alone tree flapjack! A quick shop run to pick up some key ingredients, a little bit of creativity later and somehow, I managed to turn the picture on the left to the one on the right! Not the best tree going, but it's tree inspired and the children loved him! I let the children help decorate it, with chocolate buttons and Reese's Pieces, and they went for an autumn look. This is my entry for the Firelabel best dressed baking Award. I would love to say that my creative days are over, however, I'm a mother and auntie, so I doubt they'll ever be over, and who knows, maybe one day I'll be a grandmother also, being handed odd bits and bobs, along with a plastic bottle, being asked by little people if I can create them a floating boat! Have you ever had to get creative last minute? I'd love to know what you have done!